During the cooler months does your dog prefer to curl up rather than play fetch? A sudden reduction in activity can trigger joint pain and joint problems in pets. It’s important as pet owners to monitor your fur friends and know how to spot the signs of joint pain. By following a few simple steps and becoming familiar with arthritic and joint pain warning signs, you can help put a stop to your pet’s aches and pains this winter. What Causes Joint Problems in Pets? Fun and games or fun and pain? Your dog’s joints can take a real pounding when chasing after that tennis ball or jumping off the back deck. For some dogs this can be a significant problem that may lead to joint-related problems such as ACL (anterior cruciate ligament) tears or even osteoarthritis. The two major categories of joint related problems are developmental and degenerative problems. In dogs, developmental problems affect the ongoing functional developmental milestones. This can be things such as hip or elbow dysplasia, where the joint does not develop correctly in a number of different aspects. Degenerative problems cover many areas, however the most common cause of arthritis in dogs is cruciate ligament problems. This is when the ligament degenerates over time and causes instability and secondary osteoarthritis. You may notice that your pet is doing less or perhaps showing difficulty when performing standard activities. You may also notice your pet now has a problem with getting up on the couch, or maybe going up the stairs. For others it may be that they can no longer play or go on walks as long as they use to. From here it can progress to overt lameness (holding the limb up or in an abnormal way). These are the most common symptoms your pets may show- rarely will you see overt pain as the first complaint. 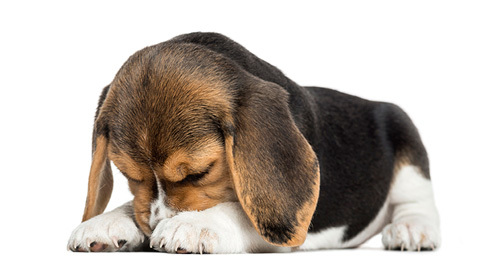 How Can You Help And Prevent Your Pet From Having Joint Problems? Joint problems in most cases develop as a result of injury much earlier in life, even when your pet is a puppy or kitten. Excessive exercise, jumping too high, and running too hard before a puppy’s bones and joints are mature can injure the joints. Try ensuring that you monitor and set boundaries to your young pet’s exercise and play routines. No matter what the age or size of your pup is they can still hurt themselves when jumping from high surfaces. Try making it easier for your dogs to do what they love without risking injury. For example, provide a dog ramp when getting out of the car, or offer them a footstool so they don’t have to risk the full distance of the leap (keeping in mind that they actually are willing to use these alternatives). As suggested by Veterinarians, it is vital to treat any suspected joint injury immediately to reduce and prevent the worsening of joint problems as your pet ages. This may involve forced rest, specific Dog Joint Supplements or Cat Joint Supplements or event surgical repair. Exercise feeds the joints by pumping natural lubrication into the areas being used. Gentle exercise keeps joints limber, and assists with keeping your pets fit and healthy. Joints can stiffen after naps, especially in the cooler months, so it can help to provide a heated bed or a gentle massage and stretch each morning to get your pet ready for the day ahead. Also noting in the cooler months to maintain and continue your usual walk routine, just don’t forget your jackets! Overfeeding or providing your pet with a poor diet can lead to obesity. Excess weight adds strain on pet’s joints’, which results in greater energy needed as well as pain when performing standard movements. Choosing the correct diet or adding Joint-Supporting Dietary Supplements can slow down the progression or even prevent joint problems in your pets. Want to find out Five Fun Facts About Man's Best Friend? Click here!